Digital Wish spent a year researching computing initiatives that provide a laptop for every child (1:1 computing). Implementing technology into a classroom effectively is a multi-step process. Too many of the schools we visited were addressing the same subset of problems, making the same decisions, and often making the same mistakes in isolation. It’s an incredible waste of resources! We set out to model the process of classroom technology adoption, and at the same time teach schools how to sustain their technology programs. By deploying 1:1 computing in dozens of schools, Digital Wish was able to isolate every step in the process of classroom technology integration, and create replicable resources. Any school can tackle the complex process of deploying 1:1 computing and avoiding the common pitfalls that inhibit school modernization. Every single line in this rubric must be addressed in order for a school to truly succeed. The Digital Wish 1:1 Implementation program helps schools identify their starting point on each stripe, as well as their eventual target. Success towards modernization is measured by rightward movement. Print out this diagram and give it to all your teachers and administrators. Challenge them to circle your current progress on the map. Then using a different color, circle your goal – showing where your school is planning to be in your next technology cycle. Let your staff do it anonymously. Now collect and compare. If the responses are wildly different, you do not have a consistent vision for technology. One of the keys to success is establishing a shared vision or technology plan. 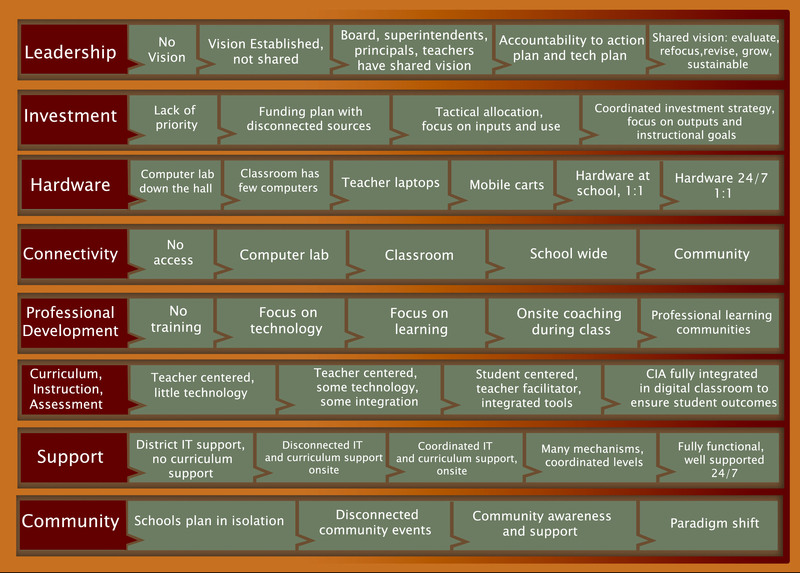 If your school is still formulating its technology plan, begin with this progress diagram, and edit it to suit your specific situation. Your vision needs to be clear, and immediately understandable. And preferrably, it should fit on one page! Once you have your vision, print it out, and hang it all over the school. It needs to become part of the daily conversation or the necessary cultural shift towards technology adoption won’t take hold. Using the 1:1 implementation kit, schools get the guidance they need to advance their own technology program.